Get Ready for those Summer Nights , don’t let them drift away. Make plans to stop by at The Right Shoe, we have your footwear covered this Summer with Dansko. Kick up your heels this summer with Dansko where you do not have to sacrifice comfort for fashion. Looking for the perfect pair of heels for a evening check out the Decatur Collection by Dansko. Dansko is approved by the American Podiatric Association providing You with all day comfort. Enjoy ! 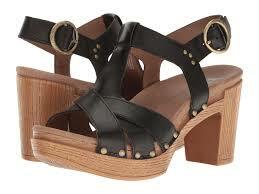 Summer Events and Festivities with Demetra ,peek-a boo open back clog, as you take a stroll on the boardwalk. Dansko will take you places with the Dector Collection in a lightweight design featuring a shock-absorbing polyurethane outsole for return energy. Watch the sunset on the Pier with the Daniela T-Strap chic chunky 3 1/4 inch heel , this classic contemporary look is functional as well as fashionable. With studded accents in an open toe the Daniela is a summer favorite. If Bohemian chic is your style, the Dawson sandal by Dansko , block heel sandal with a fresh summer time look. With the supported arch support in a cushion Dansko footbed that you have known to rely on will have you feeling confident in a high heel sandal. Weather you are looking for a peek-a-boo open back clog, or a chic chunky heel in a T-strap or you prefer a Bohemian style sandal at The Right Shoe, we have what you are looking for this season. Enjoy !! We are located in York, Lancaster, and Lititz Pennsylvania.